Since its exciting launch in August 2016, marketers and consumers alike have been leveraging the power of Instagram stories. To ensure that your Instagram business account is seeing the best possible results from stories, you’ll want to make sure your Instagram stories are entertaining, aesthetically pleasing, and easily digestible. One easy way to achieve this is posting based on the proper Instagram story dimensions. 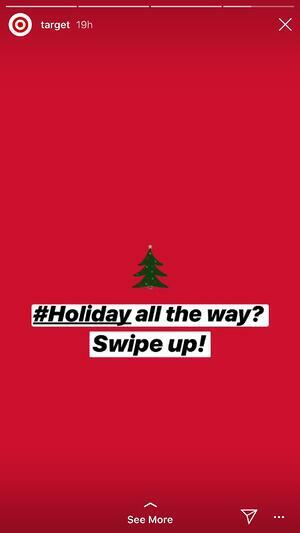 Instagram story dimensions are 1080px wide by 1920px tall. Portrait photos and videos taken on your smartphone will be 1080 pixels wide by 1920 pixels in height, while other photos and videos should be reformatted to fit these dimensions. This is also known as a 9:16 aspect ratio. That’s right – taking this simple step can be the determining factor in whether your Instagram followers engage with your story, or simply swipe right through. Before we dive into Instagram story dimensions and why they matter, let’s answer one important question: what exactly is an Instagram story? Instagram stories are a feature on Instagram that allows users to post photos and videos that, similar to Snapchat stories, disappear after just 24 hours. Creating a story on Instagram is easy. Users simply have to tap the plus-sign icon in the top left corner of the page, which will open up the story camera. From there, they can either take a picture or video directly in the app or, add a photo or video from their phone’s photo library. Photos and videos taken with the story camera will automatically fit the Instagram story dimensions. Photos and videos from your photo gallery, however, may need to be adjusted (but we’ll get to that later). Unlike typical Instagram posts, Instagram stories won’t appear in the feed, on the explore page, or on an account’s profile grid. Instead, a colorful ring around an account’s profile picture indicates that they’ve posted an Instagram story. To view the story, you simply tap on the profile picture and it will open up the story on the full screen. If the account has posted more than one story in the last 24 hours, they’ll automatically play in chronological order. As they often do with popular features, Instagram regularly updates Instagram Stories to offer new and improved functionality. For example, users can add their location, tag other accounts, add searchable hashtags, gifs, and much more to their Instagram stories. Additionally, Instagram recently launched interactive Instagram stories – an especially exciting feature for social media marketing pros. 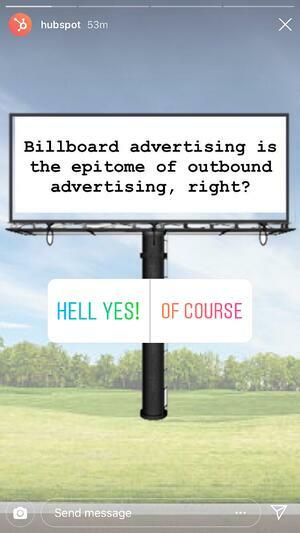 This fun feature enables the poster to add a poll or ask a question that viewers can submit answers too. For marketing professionals, this can be a creative and effective way to hear from the people who matter most – their customers. 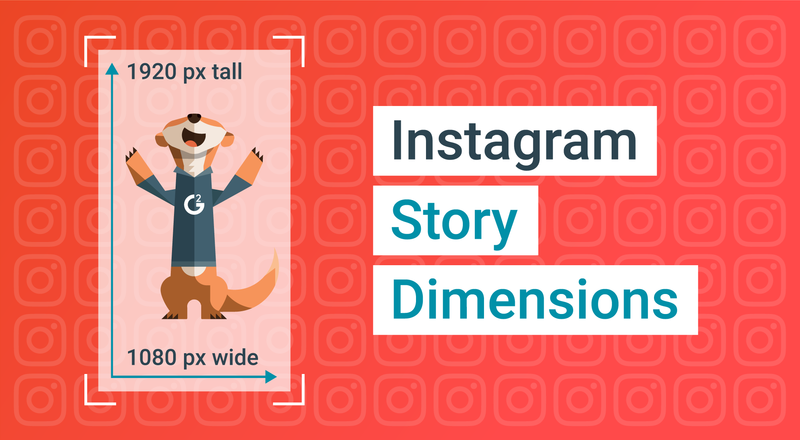 Now that we have an understanding of Instagram stories and why marketers love them, let’s get to the good stuff: Instagram story dimensions and why they matter. Did you know you can repost others' content to your Instagram? Learn How to Repost a Video on Instagram. I know – this seems nit picky. Does it really matter if your Instagram story doesn’t fit these pre-determined dimensions? Take a look at the following example. 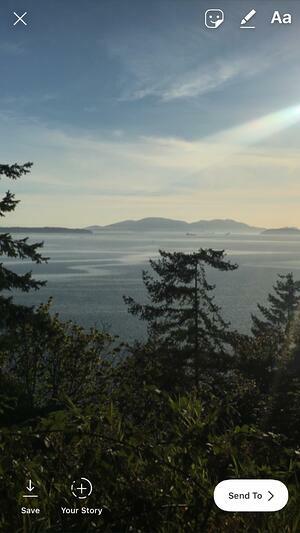 The photo I attempted to post in my story is not 1080px wide by 1920px tall, which left me with two options. The first option is the photo on the left. 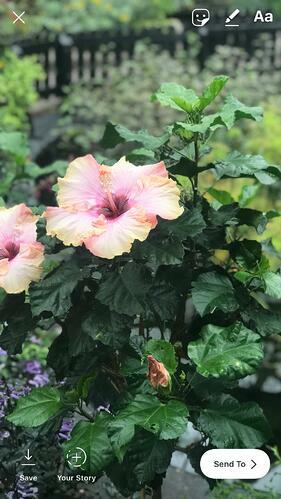 Instagram zoomed in on the photo to make it fit the dimensions. This not only significantly lowered the image’s quality but also cropped out a significant amount on either side of the image. The other option, shown on the right, was to post the image in its true form and leave a blank space on the top and bottom. Needless to say, this just looks… off. It also shrinks the image. Now, take a look at an Instagram story that did start with a picture that fit the set Instagram story dimensions. Uploading it didn’t cause any sort of quality loss – see how nice that looks? Are you starting to see why these dimensions are so important? Here’s the bottom line: there’s one surefire way to make certain that your Instagram story will look the best that it possibly can, and all you have to do is make sure you’re taking vertical photos and videos. Vertical videos? Isn’t this what we were always told not to do? It probably was. I’m telling you to scratch that. 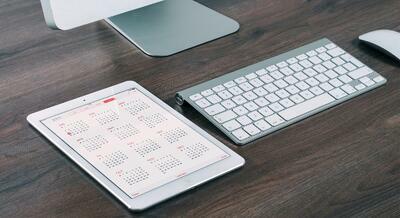 Video marketing statistics back this – more than half of all video plays are on mobile devices. Since Instagram is primarily a mobile platform, vertical photos and videos are key. 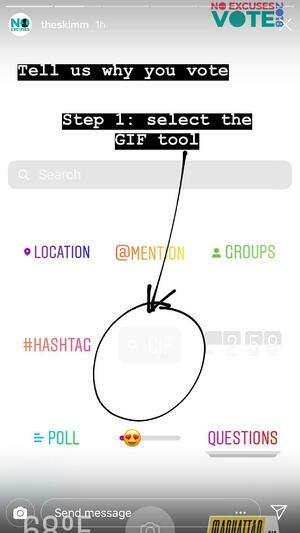 Additionally, newer facets of Instagram such as IGTV, or Instagram TV, only allow vertical video, so it’s clear the app is moving in a vertical direction. So, let’s review: the Instagram story dimensions are 1080px wide by 1920px in height. That combination will fit your screen and give you the best possible resolution. However, since this is a 9:16 ratio, there are a few other sizes that will work, depending on your goals and expectations. 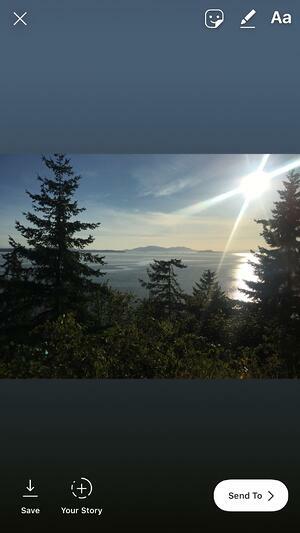 For example, a photo or video that is 720px wide by 1280px in height is a bit smaller than the standard Instagram story dimensions. This will still appear as HD, but have a slightly faster upload time. To take that a step further, a photo that’s 450px wide by 800px in height will have a much faster upload time. However, that’s the size at which you’ll start to lose your photo or video quality, so tread cautiously. If you’re looking for some inspiration, there are quite a few brands we love on social media. In particular, these three have taken Instagram stories and absolutely run with them. Let’s highlight some of our favorites and break down what exactly it is they do so well. Did you know brands can actually share each other's content on their Instagram profiles or in their stories? How to Repost on Instagram walks you through the process step-by-step and Falcon.io shares the newest Story features in 2019. Is she really using HubSpot as an example again? Yes. Yes, I am (and if you’re the social media marketing manager at HubSpot, you should know that I am a big fan). 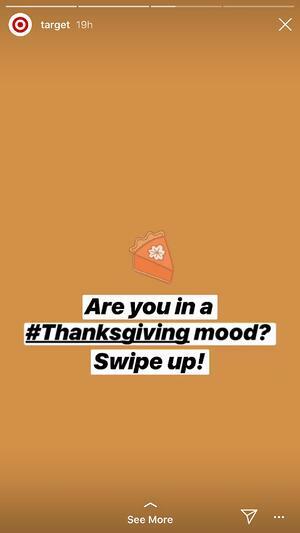 Here’s the thing about HubSpot’s Instagram stories. They are wildly interactive. More so, they understand the platform and their Instagram audience. 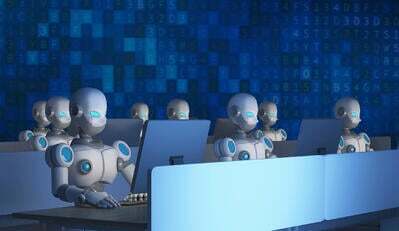 They’re not asking survey questions about marketing automation because – let’s be honest – none of their Instagram followers would care! 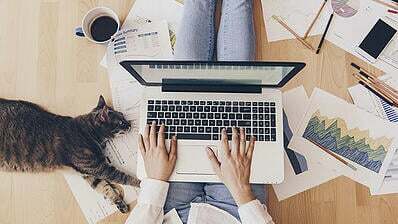 Instead, they keep it both entertaining and relevant to their business by discussing marketing best practices, social media news, tips for writing stellar content (that’s what they’re known for, after all), and more. 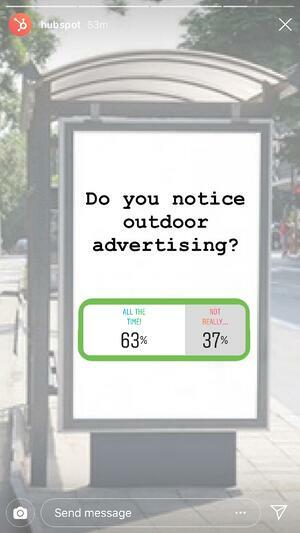 Take a look at the following examples to see how they polled their audience on outdoor advertising. Needless to say, I’m a big Target girl. I can easily spend an hour (or more) wandering around the store or browsing the furniture section of their website. As of recent, though, I’ve become obsessed with their social media presence – particularly on Instagram. Take this Instagram story for example. They keep things light and relevant by joking about the yearly Christmas vs. Thanksgiving debate while still managing to show off their seasonal line of decor. Two birds, one stone. Then, they encourage viewers to cast their ballot by voting in a poll. Finally, a brilliant call-to-action finishes out the story. 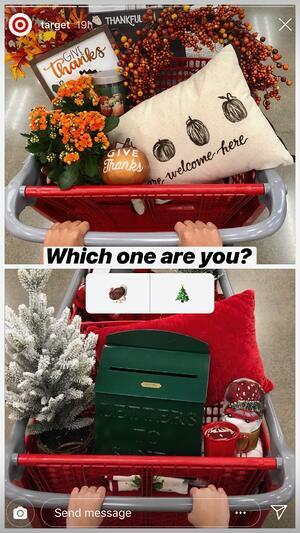 Target encourages the audience to check out either their Thanksgiving or Christmas decor, depending on whether or not they’re chill with hearing Mariah Carey’s “All I Want for Christmas is You” starting Nov. 1. Finally, I have to highlight my favorite morning newsletter: The Skimm. Every morning, I get The Skimm delivered to my inbox and read it on my commute to work. 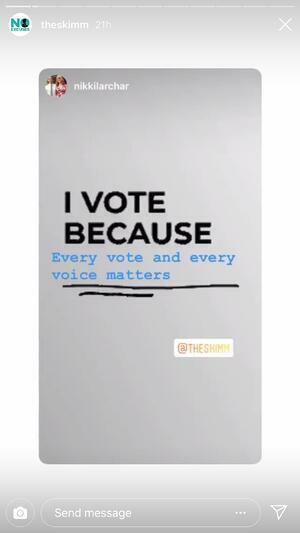 Leading up to the 2018 midterm election, The Skimm went all in on their #NoExcuses campaign which encouraged people at all points of the political spectrum to get to the polls and vote. In addition to mentioning this every day in their newsletter, they pushed the initiative heavily on their social media profiles. Take, for example, the following Instagram story. 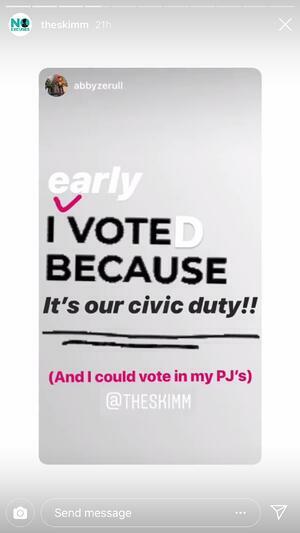 The Skimm actively encouraged viewers to create their own Instagram story and tag The Skimm with their reason to vote, announcing that they would be reposting some of the stories. This was a genius marketing move. 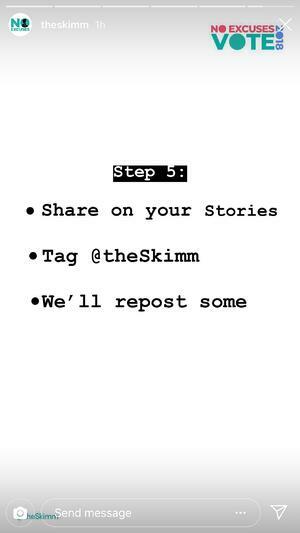 You see – people love user-generated content, and The Skimm has a massive following. I’d bet this resulted in a lot of Instagram stories spreading the word about this campaign from users who were hoping to be featured by the popular account. Look for ways to emulate Skimm's engagement by tagging people on your Instagram stories, and encouraging users to tag you, too. Are you ready to post a stellar story based on the proper Instagram story dimensions? We hope so!